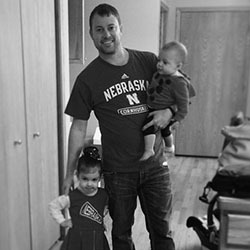 This week, we're showcasing Senior Software Engineer Troy Ray. Troy has been working here at Mortech for almost 10 years. He has two children with his wife Allison: 4 year-old daughter Amalia and soon to be 2 year-old daughter Eloise. Favorite things to do on his days off: Golfing or spending time with my family at the zoo, a park, etc. Favorite place to travel: Lake of the Ozarks or Scottsdale, AZ. Favorite time of the year: Fall for the weather and Husker football. Favorite thing about working at Mortech/Zillow: Mortech is a fairly small company and Zillow is a pretty large company, so you get the best of both. Favorite feature of Marksman: Our Dynamic Pipeline with integrated dialer. Marksman Insider Tip: If you want to make first contact with a potential borrower, the Mortech Dialer is the best way to achieve it. It will dial the lead as soon as it is created in Marksman.